GlamMan went to an Essie Cosmetics and Havaianas Sandal event tonight at the Havaianas showroom in Soho. And what a fun night it was. Along with meeting the FAB people at Essie and Havaianas, the highlight of my night was getting a professional Essie manicure. While I was admittedly outnumbered by a very colorful, well-manicured and female crowd, I was not about to pass up on a manicure. You all know Havaianas as the super-comfy and high-styled flip flop maker but you may not know Essie. Essie is known by most women as THE nail polish of choice at top nail salons across the country. Now they have a men’s product that is wonderful and I recommend it to any guy who takes good care of his nails. 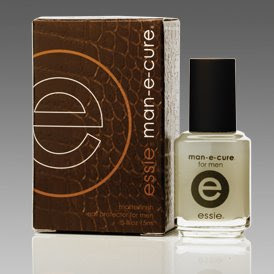 It’s a matte nail protector specially created for men called man-e-cure. One coat to clean, dry nail leaves a vey subtle, matte finish giving you the natural look and appearance of well groomed hands, a necessity. The finish is absolutely matte and incredibly clean. Man-e-cure is on my hot list. Check it out here. And as a side note, this evening I met Essie herself and she told me that Seal wears a very dark blue nail polish on his toes. Love it!